English Astronomer Royal, Sir Martin Rees, will be nominated as the next president of the Royal Society, the UK's national academy of science. The Council of the Royal Society picked Sir Martin as its candidate to succeed outgoing chief Lord May of Oxford. Lord May will complete his five-year term as president on 30 November 2005. The society's fellows will be asked to indicate their support or otherwise for Sir Martin in a ballot for the annual election of Council members. The result of the ballot will be announced at the Council's meeting on 14 July 2005. 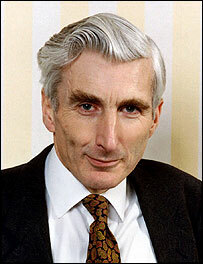 Sir Martin Rees, 62, is master of Trinity College, Cambridge, and professor of cosmology and astrophysics at the Institute of Astronomy, University of Cambridge. He has received several awards in the UK and abroad and has been English Astronomer Royal since 1995. He was elected a Fellow of the Royal Society in 1979 and served as a member of its council in 1983-85 and 1993-95. He makes frequent appearances on TV and radio and writes regularly for national newspapers. His contribution to the public understanding of science was recognised last year when he was awarded the Michael Faraday Prize for excellence in science communication. Previous presidents of the Royal Society have included Christopher Wren, Samuel Pepys, Isaac Newton, Joseph Banks, Humphry Davy, Ernest Rutherford and William Bragg.